The high alloy irons are usually produced in foundries that are specially equipped to produce the highly alloyed compositions. These irons are often melted in electric arc or induction furnaces, which provide for precise control of composition and temperature. The high alloy irons are sold at premium prices and are expected to outperform ordinary compositions in applications that involve severe service conditions. The foundries that produce these irons may be equipped with heat treating furnaces and quenching equipment or cooling facilities to provide for the most economical use of alloys. Many of these special irons are covered by standard specifications, but some are of a proprietary composition. Some require heat treatment to develop their most useful properties. High alloy cast irons are used to produce many parts for engineering applications that require resistance to corrosion in environments such as seawater, sour well oils, commercial organic and inorganic acids, and alkalis. The facility to be cast into complex shapes, and the ease with which some types can be machined, make high alloy irons attractive materials for the production of parts for chemical processing plants, petroleum refining, food handling and marine service. Two types dominate the high alloy corrosion-resistant cast irons, the nickel alloyed irons and the high silicon irons. Nickel-Alloyed Irons – A well established group of the high alloy irons are identified by the trade name Ni-Resist and have been produced for many years for corrosion-resistant applications. These versatile irons owe their excellent corrosion resistance to the presence of nickel in concentrations of 13.5-36%, to chromium contents of 1.8-6% and, in one type, to copper contents of 5.5-7.5%. The Ni-Resist irons are used to solve corrosion problems related to pumping, transportation, and processing of sour well oils, salt water, some acids and alkalis. Most of the Ni-Resist compositions can be produced as either gray cast iron or ductile cast iron. Gray Ni-Resist irons provide resistance to oxidation at elevated temperatures, as well as resistance to corrosion. The high nickel content assures the formation of flake graphite during solidification even when the compositions contain relatively high chromium contents (up to 6% in type 2b). High nickel concentrations also prevent the transformation of the austenitic matrix. The mechanical properties and physical properties of the Ni-Resist gray irons reflect the microstructure of flake graphite in an austenitic matrix. In general, the tensile strength will be in the range of 25,000-35,000 psi (170-240 MPa) and, although highly alloyed, gray Ni-Resist irons should not be considered high strength irons. Ductile Ni-Resist irons provide the same corrosion resistance as the gray Ni-Resist irons, but develop higher tensile strength and appreciable ductility. None of the ductile Ni-Resists contains copper because this metal interferes with the nodulizing process. Chromium should be present in concentrations of 2% or more for improved resistance to grain boundry corrosion where this could be a problem. Seawater applications account for the purchase of many Ni-Resist castings each year, particularly for pumps and valves. In such applications it provides substantial advantages over unalloyed or low alloy irons, particularly with respect to tolerance for higher fluid velocity and galvanic compatibility with dissimilar metals. Ni-Resists are cathodic to galvanized steel, aluminium Casting alloys and unalloyed gray iron; they are anodic to some copper base alloys, stainless steels and nickel-base alloys. Stainless steel trim is used successfully in Ni-Resist valves; stainless steel impellers and shrouds perform very well in Ni-Resist pump castings. High Silicon Irons – Irons with a high silicon content comprise the second major group of high alloy irons that are produced for corrosion-resistant applications. They are widely used by the chemical industry for processing and for the transport of highly corrosive fluids. These irons depend principally on the presence of 14.20-14.75% silicon for their outstanding corrosion resistance. They are particularly resistant to attack by a number of industrial acids, including sulfuric and nitric acids and mixtures of the two at all temperatures, by combinations of oxidizing acids and organic acids at all concentrations and temperatures, and by phosphoric acids at room temperature. High silicon cast irons are used extensively in equipment for the production of sulfuric and nitric acids; for fertilizer, textile, and explosives manufacture; for sewage disposal and water treatment; for handling mineral acids in petroleum refining, and in metal cleaning or pickling; in electroplating; for processing of paper, beverages, and paints and pigments; and as anodes for the impressed current, cathodic protection of iron pipes or other ferrous vessels buried in the soil. Specific castings of high silicon irons include pump rotors, agitators, kettles, evaporators, separator towers and Rachid rings, tank outlets, crucibles, insoluble anodes, and pipe and fittings for plumbing in chemical laboratories of hospitals, colleges, and industry. The size of castings may vary from small pump rotors and laboratory sink fittings to tower sections 48 in. (1.22 m) in diameter and 48 in. (1.22 m) high. The service requirements for many iron castings involve high temperature. To be suitable for service at elevated temperatures, cast irons must satisfy three major requirements: first, they must resist formation and fracture under service loads at the highest temperature to which they will be exposed in an application; second, they must resist oxidation by the ambient atmosphere at the service temperature; and third, to be resistant to growth, they must be structurally stable, preferably not subject to phase transformations within the temperature range to which they will be subjected in service. The special, or high alloy irons, are capable of sustaining greater stresses than ordinary alloy irons at temperatures above 1100F (600C). In addition to their higher load-carrying capacity at elevated temperature, the high casting alloy irons offer greater resistance to oxidation, and stable microstructures. High alloy irons for elevated temperature applications include gray irons, ductile irons, and white irons. the high chromium white irons which depend on the chromium content for their resistance to oxidation. The high alloy white cast irons are specially qualified for abrasion resistant applications. The predominant carbides in their microstructures provide the high hardness that is necessary for crushing and grinding other materials without degradation. The supporting matrix structure may be adjusted by alloy content and/or heat treatment to develop the most cost effective balance between resistance to abrasive wear and the toughness required to withstand repeated impact loading. The high alloy white irons are readily cast to the shapes required for crushing and grinding, or the handling of abrasive materials. Abrasion resistance is not a specific property of a metal or alloy but involves the conditions under which it is used. The ability of a part to resist a loss of weight due to abrasion depends upon its microstructure, the actual operation in which the part is involved, and the kind and size of material that is being moved, crushed or ground. In most operations the criterion of value is the useful life of the part. In many crushing and grinding applications the life of a part may be limited by its capacity to sustain repeated impact loading without fracture. 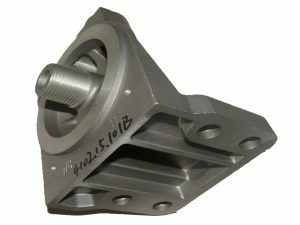 In applications for which impact loading is not severe, the life of a casting will depend upon its capacity to withstand the movement of the abrasive medium against the metal surface with a minimum loss of metal. White irons as a class of material offer considerable versatility in properties for a variety of abrasion-resistant applications. The composition of the white iron used to produce a given casting can be selected and heat treatments specified to develop the carbide distribution and the matrix microstructures that will give maximum service life and cost effectiveness. Most of the white irons designated for abrasion-resistant applications fall within the high alloy iron category, but unalloyed white irons are commonly produced and provide satisfactory service where the abrading material is not fine or where replacement is not frequent nor expensive. The alloyed irons all contain chromium to prevent the formation of graphite and to insure the stability of the carbides in the microstructure. Many of the alloy white irons also contain nickel, molybdenum, copper or combinations of these metals to prevent or to minimize the formation of pearlite in the microstructure. 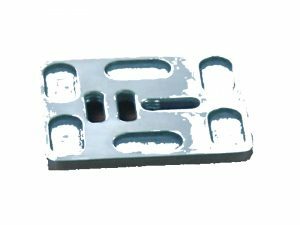 Unalloyed white iron die castings develop hardnesses in the range 350-550 Bhn. Their microstructure consists of primary iron carbides with a microhardness of 900-1200 Vhn in a matrix of pearlite with a microhardness of 220-300 Vhn. Alloyed martensitic white irons, however, develop Brinell hardnesses in the range 500-700. The carbide hardness remains at the level of 900-1200 Vhn, but martensite (always associated with some retained austenite) exhibits a microhardness of 600-700 Vhn. For many abrasion-resistant applications, the more expensive alloyed white cast irons with martensitic matrix structures provide the most economical service. ASTM Specification A532 covers the composition and hardness of abrasion-resistant white irons. 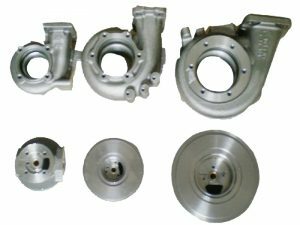 Many castings are ordered to these specifications; however, a large portion of abrasion-resistant white iron castings are purchased in accordance with modifications recommended by foundries for specific applications. For economical performance, it is desirable that designers, metallurgists and foundrymen work together to specify the optimum composition, heat treatment, and foundry practice to develop the most suitable abrasion-resistant parts for each application. the high chromium irons containing 14-28% chromium with 1-3% of molybdenum, often alloyed further with additions of nickel or copper. A third but minor category comprises the straight 25-28% chromium white irons. This article has been excerpted from the publications “Iron Casting Handbook,” American Foundrymen’s Society, Des Plaines, Illinois.